Case Western Reserve University’s innovation and entrepreneurship center, the Larry Sears and Sally Zlotnick Sears think[box], is a place to bring ideas to life. From a vaccine carrier to a concrete 3D printer, a portable pulse oximeter for field use to plasma fuel injection systems to make airplane engines more fuel efficient – and everything in between – Sears think[box] provides budding innovators with all the tools they need. Sears think[box] occupies all seven floors of the Richey Mixon Building on the university’s campus in Cleveland, Ohio, and follows the innovation process from ideation to incubation, providing visitors free and open access to top-of-the-line prototyping and fabricating equipment, startup support, legal assistance, incubator space, and simply places to meet, brainstorm, and get to know like-minded people. “We wanted a space where students from the Cleveland Institute of Art would mingle with our engineering and science students, along with law and management students, and community members, because that’s a real-world team,” says Ian Charnas, Sears think[box] director of innovation and technology. As such, the first floor will be a community space to teach innovation processes and house outreach programs. The second floor is dedicated to collaboration and idea generation. 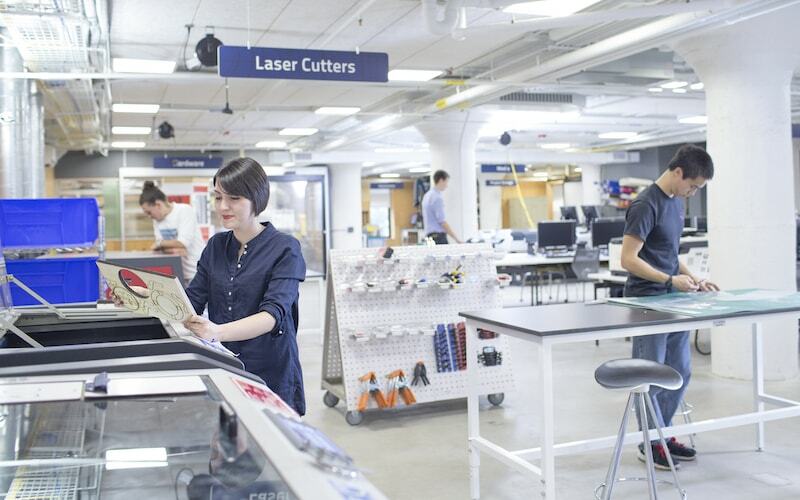 The third floor is home to collections of high-end prototyping tools such as 3D printers, laser cutters, and printed circuit board routers for embedded electronics. The fourth floor offers access to complete woodworking and metalworking shops including waterjet cutting and welding studios. On the fifth floor, project space is provided for student groups and senior projects, such as the Society of Automotive Engineers’ student design team’s competitive off-road vehicle, and the CWRUbotix team’s NASA mining robot. For projects that harbor commercial potential, the sixth floor houses offices of the law school’s IP Venture Clinic, which provides free, professional advice on intellectual property protection; CWRU LaunchNET, which provides resources for business plan development, fundraising, and other business mentorship; and the university’s Technology Transfer Office, which helps commercialize research breakthroughs. And the seventh floor provides incubator space for burgeoning startups to have office space, support, and mentorship. Sears think[box] provides support for projects throughout the entire innovation process. Charnas notes that more than 100 ventures have been developed using the resources of think[box] and CWRU LaunchNet. These ventures have spurred dozens of jobs and patent applications, and have successfully raised more than $12 million of external funding for their startups. It’s no wonder the Sears think[box] model has built a reputation for successfully encouraging and cultivating innovation. The innovation center has received enthusiastic support from entities such as the Burton D. Morgan Foundation and the Veale Foundation. And the center’s staff receives near-constant requests for consultation and has already worked with more than 200 institutions to develop their own innovation systems, from top-tier research universities to two-year colleges to high schools and Fortune 500 companies – everywhere from Nevada to Akron, India to New Zealand.